When it comes to having an amazing sleep, the comfort of the mattress is not the only thing that matters but also the pillow that you use. Sleeping pillows are excellent at supporting some parts of the body like the head, neck, hips, as well as the lower back and so one. Pillows come in different types basing on the material used, and some of them include the following. 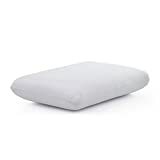 Memory foam pillows: These are pillows made from memory foam, and they mold to the shape of the head in seconds and return to normal when you wake up. Down pillow: These are the softest pillows, and they are made using delicate fluff that is located on the bellies of water birds. They are very soft and supple. They do not give support. 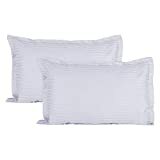 Feather pillows: They are made from feathers that are soft, curly, and very popular. They are very comfortable. Body pillows: They are excellent for whole body support and great for pregnant women. Contour pillow: This is a pillow that is shaped to accommodate your head and support your neck. It is great for back and side sleepers. Water pillows: The upper part is made using polyester material while the bottom is supported by a water bag. Polyester: This is a type of pillow that is made from any Man-made filling. It is very popular. 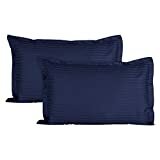 The material used: As seen there are different kinds of sleeping pillows depending on the material used. Your needs: What do you want the pillow for: are you pregnant? Do you want to support your lower backs or hips? Or is it just the neck and head? These are to be put into consideration. Sleeping position: Do you sleep on your back, on your stomach, or on your side? This will determine the pillow you will choose. You should watch below video to understand few more things to consider to pick the best pillow for yourself for a good sleep. 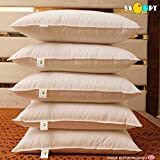 Now that you have all the details,it is time to finalize your decision.To make your selection process even easier,here is the list of best selling sleeping pillows online in India.Go through the list and pick the right pillow for you. Extra special comfort and support for babies: The bolsters are designed in a special way to bring extra comfort, support to babies and relief to mothers that their babies are protected and comfortable. Baby bolsters create a calming psychological effect that helps newborns enjoy a quiet and restful sleep. This can prevent the baby from rolling over or can be used as a bumper in the crib and can also be used as an anti-roll pillow to prevent the baby from falling out of bed. Soft and Supportive Memory foam Comfort: The bolsters are made with soft memory foam, which provides excellent support to them. Baby Bolsters provide comfort and safety to the baby by stimulating the touch of mother's embrace when placed on the chest and abdominal area. Also, the memory foam in the bolster evenly distributes body weight and then returns to the original shape once the pressure is removed. Premium Bamboo Cover: Bamboo fibers in our special bamboo cover, fills the gaps and small holes that provide space to absorb and evaporate human sweat. In addition, it also ensures the bamboo fiber feels cool and fresh. Babies feel relaxed, comforted and happy. Moreover, The Premium Jersey fabric is stitched as an inner covering to protect the memory foam layer and must never be washed. Hypoallergenic, Eco friendly, Safe to use bolsters which are Better than Polyfill or Microfibre Filled ones: Unlike other fill materials like Polyfill, or microfiber that lose their quality and shape with time often in bolsters, Memory foam bolsters provide added support and comfort to its users. Moreover Memory foam is anti dust mite resistant, free from allergens, BPAS while microfiber or polyfill can cause rashes, or makes their skin itchy, which can make babies cry or feel uncomfortable.
" CARE AND WASHING OF BABY BOLSTERS: For inner bolster foam pad: Do not hand wash or use machine only spot clean by hand with warm water and mild detergent, For removing stains or odor, sprinkle baking powder on the pillows and dust them off, with a clean dry cloth, For Outer Cover: Easy clean with soap and water. Use the mild liquid detergent, preferably non-alkaline, without added bleach or whiteners. Don't pour detergent directly to the pad. " Wakefit Pillow - 27" x 16"
Has 2 cm flange on every edge. Yarn quality is 60s and thread count is 300, ensuring a soft and luxurious feel. Feel: A Sleepyhead pillow combines the goodness of micro ﬁbers and a breathable mesh that provides the perfect support and softness for your head and neck. Enjoy a Restful Sleep at Night by Using These Pillow fillers. Fabricated From Smooth Materials, These Pillow fillers are Soft Against Your Skin. With a Snug and Cosy Nature, These Pillow Inserts will Provide You a Luxurious Comfort That is Hard to Miss. 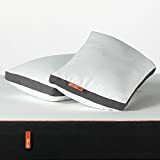 PumPum Sleeping Pillow (Single Piece) -17" x 27"
Ideal For Ones Who Prefer Low Raise Pillows While Sleeping And Have Bodyweight In The Range Of 48Kgs To 60Kgs. 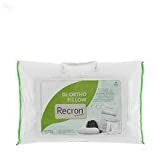 This Pillow Has 1.4 Kgs Fibre Filling And Xl Has About 2.4Kgs Fibre Filling, Making It Easily Movable Through The Night And Easier To Carry Around. Momtobe C Shape Maternity Pillows Allows You To Enjoy A Better Quality Sleep - One Pillow For All Around Support And Comfort For A Full Night'S Sleep. Designed Under The Guidance Of Best Gynaecologists And Physiotherapists Taking In Account Minutest Specification To Provide Maximum Comfort. Total Body Support For Pregnancy, Aches And Body Support. Ultra-Soft, Hypoallergenic, Non Reflexive, Conjugated Microfiber Pillow. Includes Detachable Zippered Pillow Cover. Releases Pressure In The Back And Shoulders By Allowing An Even Spread Of Support From Head To Toe. Great For Maternity Pains During And After Pregnancy. Adheres To Internationally Accepted Quality Standards. Extra Wide Arms For Side Body Support. Can Be Used For Pregnancy, Reading, Lounging. Post Pregnancy It Can Be Used For Breastfeeding. Flexible Design For Multipurpose Use. 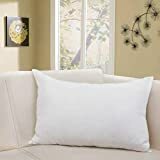 Protector Case for pillows.White Cotton Terry fabric with waterproof barrier inside, protects your complete pillow from fluids and spills.Perfect for regular use to protect for pillows from liquid spills and stains. Soft, breathable fabric creates a cooler, more comfortable sleep surface - no crinkling sound or plastic feel. 100% Waterproof with Airflow Technology that allows air to circulate through the protector, but repels liquids. 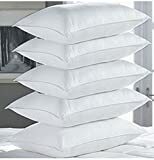 These are NOT PILLOWS, only pillow protectors as per above description. Package contains 2 pillow protectors.Machine wash in cold water. Protects against allergens, dust mites, bacteria, perspiration, drolling and fluids. Ideal for keeping your pillow hygenic. 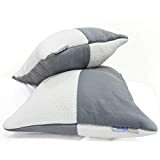 If you have neck pain then you should be considering right type of pillow to reduce your pain.Watch the below video to get the right pillow to reduce your neck pain and helps you sleep peacefully.